If you're able to look past the glitz and glam of Egg Roll Squirrel, beer and pizza are in the running for the most iconic food duo of all-time. With the Super Bowl just around the corner, there's no better time for the hub of stuffed-crust pizza to expand its relatively new beer and pizza delivery service. 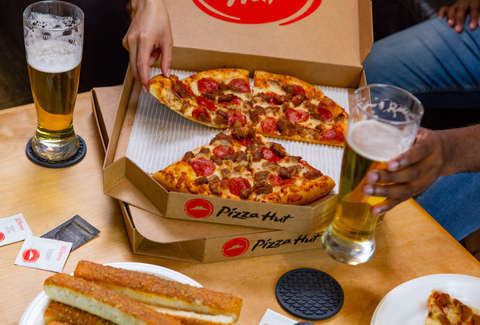 Pizza Hut launched a test of a new beer delivery program in late 2017. The service expanded to nearly 100 locations in May 2018. You could order a pizza and have a six-pack of beer dropped off while they're at it. The initial launch was limited to about 100 restaurants in Arizona and California. On Monday, the pizza chain announced a massive expansion of its beer delivery service. You can now get pizza and beer at your doorstep from nearly 300 restaurants in Florida, Iowa, Nebraska, North Carolina, and Ohio, in addition to expanded service in Arizona and California. Pizza Hut said in the announcement that it plans to expand the service to 1,000 restaurants by the end of the summer. The expansion arriving this close to February's Super Bowl is no coincidence. It's a massive pizza and beer sales day, a point emphasized by Chief Brand Officer Marianne Radley in the company's announcement. "As the official Pizza Sponsor of the NFL, we've been celebrating football fans all season long, so it only makes sense for us to bring more customers the beloved combo of pizza and beer ahead of the Super Bowl," she said. So, if you're having a Super Bowl and completely forget about it until the last possible moment, Pizza Hut can help you make it look like this was all just part of the plan.